I have had fun following the 31 days of Flowers challenge on the House That Lars Built. Each day during the month of May Brittany has shared a short video showing how to draw a type of flower. She also shares a few fun facts about each flower. I really enjoyed learning more about the Protea and Pincushion Protea. I have seen Proteas in arrangements and bouquets, but I didn’t know the name or much about it. 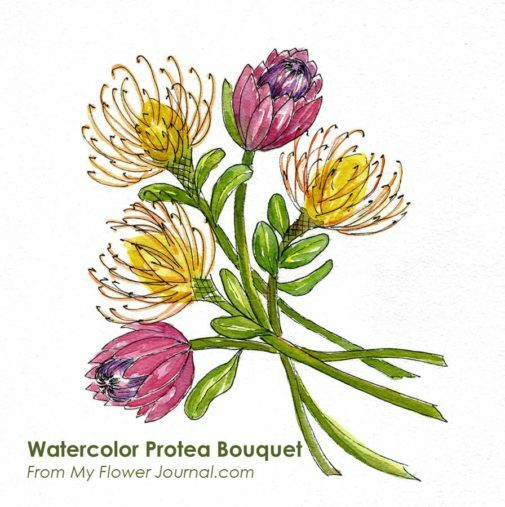 After watching Brittany’s tutorials I drew a Protea bouquet then added watercolor to finish it. If you want to improve you flower drawing skills you can watch her free tutorials on You Tube. Brittany also has a beautiful Flower Coloring Book. Some of the flowers she shows how to draw in this challenge are included in her book. You can read about my favorite watercolors here and here. I love the colors and the style of flowers! !